We loved this park. It's in a gorgeous location and is nicely isolated. Nice views in every direction. Everything is nicely maintained. The staff were super friendly. We also enjoyed the delicious home-made muffins available every morning. We will absolutely stay here again if we're ever in the area. At Thousand Lakes RV Park, you will enjoy views of red rock mountains and sagebrush covered plateaus from every site. 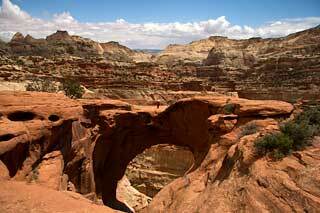 Just 6 miles from Capitol Reef National Park, we are convenient to Grand Staircase-Escalante National Monument, spectacular National Scenic Byway 12, Goblin Valley and Bryce Canyon. Hiking, fishing, mountain biking, 4-wheel-drive back road excursions and leisurely drives are all just minutes away. Because our area is not as well known as other Southern Utah destinations, you won’t find crowds, even in peak season. Thousand Lakes RV Park offers a full range of accommodations, including a full-service RV park with 65-foot pull-thru spaces, shaded tent sites and deluxe cabins large enough to sleep 6. Groups appreciate our covered pavilion with picnic tables. Everyone enjoys our chargrilled, scratch made BBQ dinners, fresh morning muffins, clean facilities, pool, playground, basketball court, satellite hook-up, and, of course, our outstanding views. 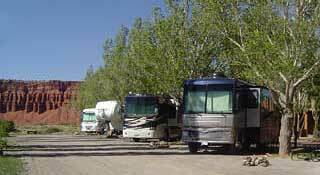 Our RV Park is a family-run businesses and as second generation residents of the area, we have driven and explored just about everywhere within a few hours of our campground. Jeep Rentals are available from Capital Reef Jeep Rentals conveniently located on our premises. Stop by our office for our personal recommendations to help you enjoy your visit. Unforgettable scenery, unlimited outdoor activities, a full array of services, no crowds.